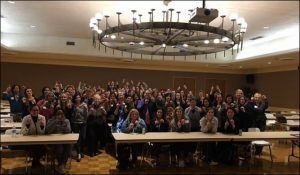 The NIU School of Nursing was proud sponsor of the Illinois Society for Advanced Practice Nurses (ISAPN) Boot Camp on April 28-30. This was a regional event made available to all interested advanced practice nurses (or soon to be advanced practice nurses). Approximately 85 nurses attended the training. While this is the first time NIU has hosted in several years, it was actually 10 years ago that NIU hosted the first ISAPN Boot Camp event – so it was appropriate that 2017 saw the event return to NIU’s campus.